Chinese New Year celebrations are never complete without an auspicious dinner with family and friends. 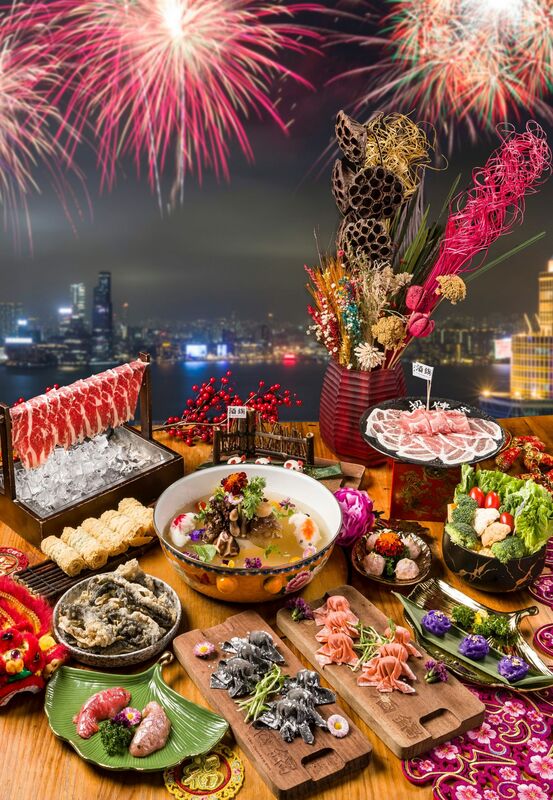 For those opting for authentic traditional festive feasts, look no further to Yan Toh Heen’s special Chinese New Year fireworks menu at InterContinental Hong Kong, where a premium eight-course dinner is served with front-row seats to a splendid Lunar New Year fireworks display over Victoria Harbour. Specially crafted by executive chef Lau Yiu Fai, it starts with barbecued suckling pig, crispy roll with sea moss, golden lobster with spicy salt and wok-seared sun-dried oyster. Next is the double boiled sea cucumber with fish maw and braised whole abalone in oyster jus followed by a steamed eastern star garoupa fillet and wok-fired wagyu with white fungus and winter bamboo piths. Two heart-warming desserts—sweetened red bean cream with glutinous rice dumplings and chilled red date pudding—end this fabulous dining experience on a sweet note. The dinner is priced at HK$2,988 per person and is available on February 6, with the fireworks display scheduled for 8:00pm. We couldn’t find a better way for you to usher in the Year of the Pig than with an exquisite plant-based menu prepared by chef Chan Hong Cheong at One Harbour Road, Grand Hyatt Hong Kong—where even meat lovers are sure to enjoy these dishes. Using the plant-based pork alternative, Omnipork, from Green Monday founded by Tatler 500 lister David Yeung, chef Cheong offers new interpretations of traditional meals and offers guests. We can anticipate an innovative menu with dishes such as deep-fried lotus root with Omnipork, chestnuts, coriander, celery and morel mushrooms; and roasted Omnipork stone bowl-fried beetroot rice with yellow fungus to name a few. The vegetarian menu is priced HK$568 per person, available now until February 28. Planning a quick getaway with your beloved ones to celebrate Chinese New Year? Macau is a lovely last-minute destination for its Portuguese charm and close proximity to Hong Kong—not to mention we’ve found a stunning four-course French menu to savour at The Ritz-Carlton Café at The Ritz-Carlton Macau. The sumptuous dinner begins with a smoked salmon carpaccio accompanied with fennel salad and beetroot caviar. Next is the wild mushroom consommé with black winter truffle and spring vegetables, which will whet your appetite for the main course; your choice of slow-cooked pork chop with pan seared scallops or the grilled M6 Wagyu beef striploin with spinach mash and sautéed asparagus. An dessert of tapioca pearl mango sorbet and coulis with white chocolate is then served to complete your perfect meal. The exclusive menu is priced at MOP$688 per guest, including a welcome drink. It is available from February 4 to 11. Known for its wide array of innovative soup bases and quality hot pot ingredients, The Drunken Pot brings diners a luscious touch of warmth this season with its Year of the Pig hot pot banquet set. With splendid urban décor and front-row seats to the fireworks, it's the perfect venue for you and your family to toss for good fortune. The menu features a twist in the classic “Chinese New Year Buddha Jumps over the Wall Broth”, made with fresh chicken and luxurious ingredients such as dried mushrooms, abalone, dried scallops and sea cucumber. Decorated with edible flowers and cuttlefish-paste in a fish shape, which is a symbol for prosperity in Chinese culture—it’s just too pretty to eat. Presenting only the finest and freshest hot pot ingredients such as foie gras minced pork balls, caviar pork balls, cute piglet-shaped squid dumplings and sliced Angus beef short ribs, these premium treats are going to make your new year celebration extra special. The hot pot menu is priced at HK$468 per person, for a minimum of four persons, available from now until February 10. This year, Duddell’s is launching a decadent feast for you and your loved ones to savour during the Year of the Pig. Renowned for its balance of artistic glamour and old traditions, guests can enjoy a lavish array of dishes from the taste of Chinese culture to subtle exotic flavours. The dinner begins with a beautiful roasted suckling pig and stuffed crab shell with fresh crab meat and onion. Next is the sautéed prawn with vegetables and braised dried oyster with conpoy and sea moss, which symbolizes the best wishes to a year of happiness and prosperity. Coming up will be the braised whole Yoshihama abalone 30 heads with Kanto sea cucumber, where the premium dish will just take your dining experience to another level. A warming dessert—double sweetened imperial bird nest with almond cream will be specially prepared for you for a fragrant and sweet sensation. The 11-course menu is priced at HK$19,988 for six persons, and HK$38,888 for 12 persons, available from February 1 to 14.